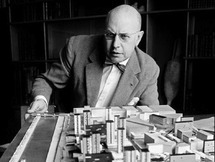 Pedro Ramírez Vázquez was a late twentieth century Mexican architect. He was persuaded to study architecture by writer and poet Carlos Pellicer. 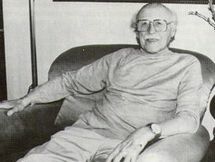 Vázquez earned a Bachelor of Architecture degree from UNAM in 1943. He was responsible for the construction of some of Mexico's most emblematic buildings. 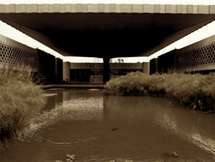 He was a modern architect with influences from the European modern movement, Latin American modern architects and precolumbian cultures. Concrete is the material he used most often. He developed a system to construct schools in rural areas, constructing thousands of schools in Mexico and abroad. The UNICEF has used such system. He was the president of the organizing committee of the Mexico City Olympics in 1968 and the World Cup in 1970. He was a pioneer in Mexico of modern graphic design, with the design of the Olympic image. He is a member of the International Olympic Committee. He was minister of public infrastructure and human settlements during president's José López Portillo government. He was founder and rector of the Universidad Autónoma Metropolitana. He was part of the faculty of the UNAM and received various honorary degrees (doctor honoris causa) granted by several universities including the UNAM.